Heat oven to 300 degrees. Melt oil in a large Dutch oven or soup pot over medium-high heat. When oil shimmers, add shallots, ginger, lemongrass and a generous pinch of salt. Reduce heat to low. Cook, stirring occasionally, until shallots are tender and just starting to brown, about 18 minutes. 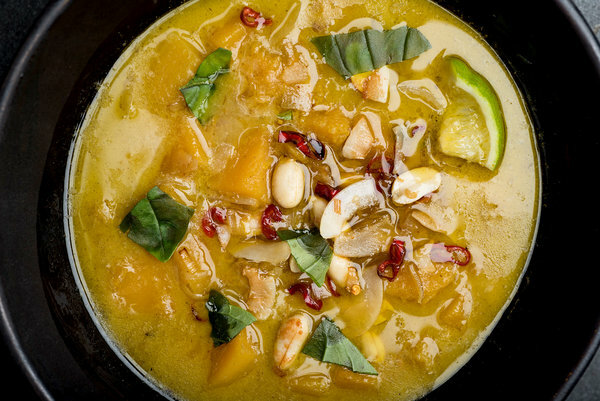 Add squash, coconut milk, curry paste, 3 tablespoons fish sauce and 3 cups water or stock. Increase heat to high. When liquid comes to a boil, reduce to a simmer and cook the soup covered until squash is tender, about 25 minutes. Make garnish while soup cooks: In a medium mixing bowl, toss together peanuts, coconut flakes, fish sauce, chiles, 1 tablespoon oil, the minced lemongrass, the sugar and the lime leaves, if using. Spread mixture out onto a baking sheet in a single layer. Bake for 18 to 20 minutes, stirring every 3 minutes after the first 10 minutes. Remove from oven when coconut is deep golden brown, and pour mixture immediately into a bowl to prevent overcooking. Stir to combine, and set aside. Remove soup from heat. Remove lemongrass stalks from pot. Use a hand blender to purée soup. Alternatively, transfer soup in batches to a blender or food processor and purée. Taste and adjust for salt and curry paste. Add water or stock to thin soup to the desired consistency. Thinly slice the basil leaves and arrange on a small plate or platter, along with lime wedges and peanut mixture. Serve soup hot with garnishes. This entry was posted in Uncategorized on 01/12/2017 by gleanslo.